Generation Hire & Sale, its partners and clients raised £880 for My Name’5 Doddie. The charitable foundation set up by rugby legend Doddie Wier to fight Motor Neurone Disease (MND). Doddie Wier won 61 Scottish caps and as captain led Newcastle Falcons to win the Premiership in 1997-98. In 2017 he announced that he had been diagnosed with MND. The player approached the terminal disease with the same determination and approach shown on the rugby field. “On the charge like a mad giraffe” he has beaten all the prognosis that said he would be wheelchair bound to live as full and active life as possible and raise funds to support sufferers and find a cure. In total to date since his announcement he has raised over £1m. 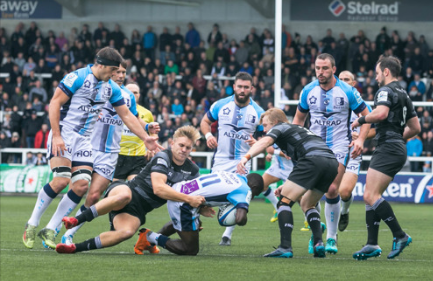 Doddie’s association with Newcastle Falcons made the recent European clash between the club and Altrad sponsored Montpelier (MHR) the perfect backdrop to raise funds. Altrad Generation ran a raffle for the 70 clients, suppliers and partners invited to the game. The prize winner selected at random by Ex-England International Jeff Probyn, who is a trustee of the Foundation. The Altrad Group’s love and support of rugby is driven by the sport’s values. Rugby’s core values of respect, solidarity, team spirit, commitment, courage, selflessness and humility are at the core of the Altrad Group and its outreach programme to the industries and communities it operates in.